3:29 PM I sent you the attachment of South East Union School. I don't see the post of this and wonder if you had got it or not? Also I wonder if I could sent you some old photo and you post for me?? Yes, I did receive the photo, but I have not had a chance to post it. My "edit" features for this site have not been working. I am in the middle of moving and can only get on the computer while at the historical society. I will get to these things as quickly as I am able. The technical difficulties will need to be reported to "citymax" as soon as I have time. I truly apologize for the delay on all of this. Hang in there - I'll be back! 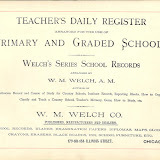 South Eastern Union School 1897-98 - Emma Houch. 7:06 AM I just sent you five attachments and will you pls put title on each of them. ? Thank you! Click on photo to open album. If you have G-mail, you can post a comment under photo. Click on photo to open album. You can enlarge the photo, read details and if you have G-mail, you may leave a comment under photo as well. Then in 1904 Earl Noon is listed in Cloverdale School (non-passing) and Cloverdale is on our list. Cloverdale is located on Ralph McCreedy’s property which is South East of P’town and as near as I can tell sort of near the corner of routes 172 and 92. It is listed as district 78. Mr. Steinert is here today and he said all the information is on this list, the big map and the ledger books. He wouldn’t know who to ask where the school was. I think either it is the Cloverdale School, or it was located in a house or something for a short time before Cloverdale. Morrison Library has some information, but not sure how much. You should come and check it out sometime just for the fun of it! Been a while since I came here to post. I was so happy to find this obit. 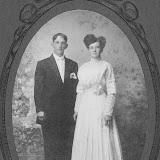 here of my ggrandfather Elijah Wells Osborne and wondered to see if you would find obit on my ggrandmother Nellie (Schieferdecker) Osborne whom was married to Elijah Osborne. She died on Feb 25 1988 and buried at Tampico Cemetery. Thank you! I can transcribe it on my next visit to the library or you can contact the Sterling Library and request a copy be sent to you (small fee). The day was spent visiting and games were enjoyed. Charles Houch of Monrovia, Cal., was an honored guest. It was voted to make the reunion an annual event and the following officers were elected; President, Mrs. Ernest Toppert, Sr., of Prophetstown; vice president, Mrs. Casper Sandrock of Morrison; secretary and treasurer, Mrs. Charles Reider of Sheffield. The entertainment committee was appointed as follows: Mrs. Casper Sandrock of Morrison, Mrs. Albert Reider of STerling, and Mrs. Gus Roman of Prophetstown. Chas. Houch of Prophetstown. Mr. and Mrs. Albert Reider and Carl Houch of Sterling, and Mr. and Mrs.
Casper Sandrock and children, Ruth and Vera of Morrison.